The tie will be held from 20-21 April 2019. Ashleigh Barty (Qld) will lead Daria Gavrilova (Vic) and fellow Queenslanders Samantha Stosur and Priscilla Hon in the Fed Cup by BNP Paribas World Group semifinal against Belarus, Fed Cup captain Alicia Molik announced today. The crucial semifinal will take place at Pat Rafter Arena in Brisbane from 20-21 April 2019. World No. 58 Gavrilova comes in with recent wins over world No. 37 Dayana Yastremska (UKR) and world No. 31 Mihaela Buzarnescu (ROU). Last tie against the USA she stretched Australian Open semifinalist Danielle Collins to three sets and will be looking to build on her Fed Cup form. “We’ve selected a really strong team and it’s going to be a great fight between Australia and Belarus,” Alicia Molik said. “Ash has gone from strength-to-strength, and we are extremely lucky as a nation and team to have such a fantastic role model on-and-off court. She is one of the world’s best Fed Cup players with her versatility in singles and doubles, and a great leader and asset to the team. “It’s also exciting to welcome Sam back into the team, she has a really strong Fed Cup record and her recent doubles results are unparalleled, and Dasha and Pri are both great team players. They always enjoy Fed Cup weeks and have had some great matches since the US. “Reaching a Fed Cup semifinal is an amazing feeling not only for me as a captain, but the team and Australia. I know they are all incredibly proud to represent their country and will give it their all as we try to make our first final since 1993,” Molik continued. World No. 39 and Australian No.2 Ajla Tomlanovic (Qld) is unfortunately ineligible to compete for Australia in Fed Cup due to ITF regulations as she has previously represented Croatia in 2010 and 2011. The Belarus team is expected to be revealed today. The European nation boasts a strong line-up of top players, including world No.9 Aryna Sabalenka, two-time Grand Slam champion Victoria Azarenka and Brisbane International 2018 finalist, world No.35 Aliaksandra Sasnovich. The tie will be broadcast live on Nine’s9Gem from 1.00 pm AEST on Saturday 20 – Sunday 21 April. Single session and two-day ticket packages are on-sale via www.ticketek.com.au/fedcup. Adult prices start at $30, concessions $25, kids $5 and family passes (two adults and two children) start at $65. Australia last won the event, previously known as the Federation Cup, in Italy in 1974. The team of Evonne Goolagong, Dianne Fromholtz and Janet Young defeated the United States 2-1. 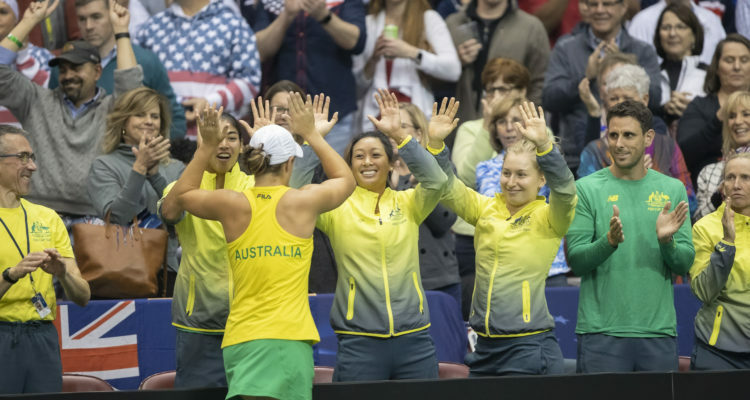 The Fed Cup by BNP Paribas World Group semifinal between Australia and Belarus is supported by the Queensland Government via Tourism and Events Queensland and Brisbane City Council via Brisbane Marketing. This entry was posted in Davis Cup / Fed Cup, Fed Cup and tagged Australia, Fed Cup.